Thank you to those of you who have sent well wishes with the recent San Diego fires. Our house is fine for now, but I’m sending thoughts and prayers to everyone affected. You can see the smoke from the freeway, and it’s heartbreaking to hear of those who have had to evacuate their homes. This morning, I have a new snack option to share. We’ve gotten into a bit of a snack rut. I’m a creature of habit, and if I wasn’t determined to switch things up for Livi’s sake (and create fun things for this little blog here), I’d probably eat the same.exact.things every single day. It would look something like: breakfast (egg burrito + coffee), snack (green smoothie), lunch (giant salad and green juice), snack (amazeballs, coffee, some kind of chocolate) and dinner (grilled chicken, sweet potato, asparagus, and wine). Anyway, I decided to change things up in the snack rotation and try a new almond-based hummus-ish recipe. At the farmer’s market last weekend, there was a creation called “Bitchin’ Sauce,” which is basically almond hummus (minus the tahini). I gave it a whirl, decided should go back to purchase some on the way out, and spaced it. Since then, I haven’t been able to stop thinking about it! 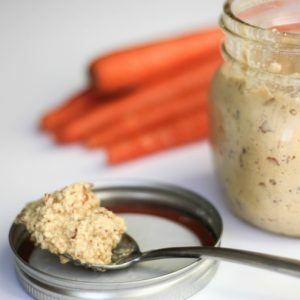 It inspired me to use almonds as the base for this vegan dip, which is absolutely delicious on top of crackers or fresh veggies. It will make a bomb wrap filling too. 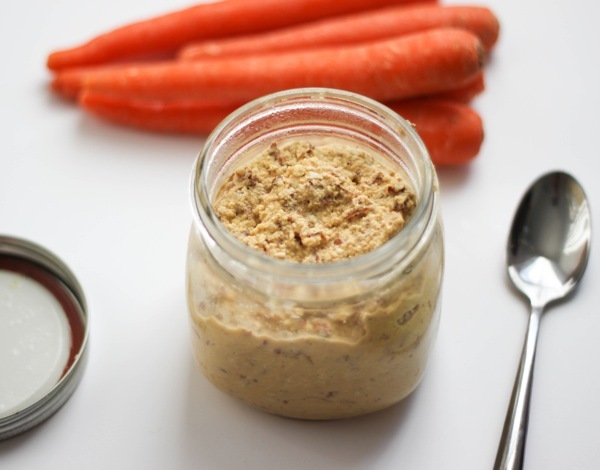 A nutritious and savory dip for veggies or crackers. A fun way to switch things up from the usual hummus. Blend all ingredients in a high-speed blender until smooth. Store covered in the fridge. Feel free to add any spices or flavor variations you enjoy! Yum! This sounds amazingly good. I understand what you mean when you say you’re a creature of habit. 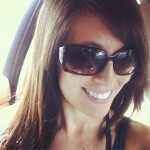 If it weren’t for my blog, I wouldn’t venture too far away from my routine either. Yeah, this looks awesome! I’ve been craving dips and spreads lately and the easier the better (not that dips and spreads are rocket science, but you know what I mean). 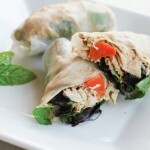 I bet this would be awesome with some crumbled feta, lettuce, and tomato on a sandwich! Have a great day, Gina! OMG that looks SO good. I’m going to have to try that. Glad to hear you’re safe. I think I’m a creature of habit as well. At least we’re consistent 🙂 And YES to chocolate!! sounds amazing! I wonder if I could use the raw almond butter that’s been sitting in my pantry as the base and just add the spices! yum! omg I’m SUCH a creature of habit, too. Sometimes it’s just easier than thinking of something different to eat, right? The dip sounds delicious! I’m a big dip fan so will definitely give it a try. I always have a traditional hummus on hand but lately I’ve also been making a sweet hummus for a change. 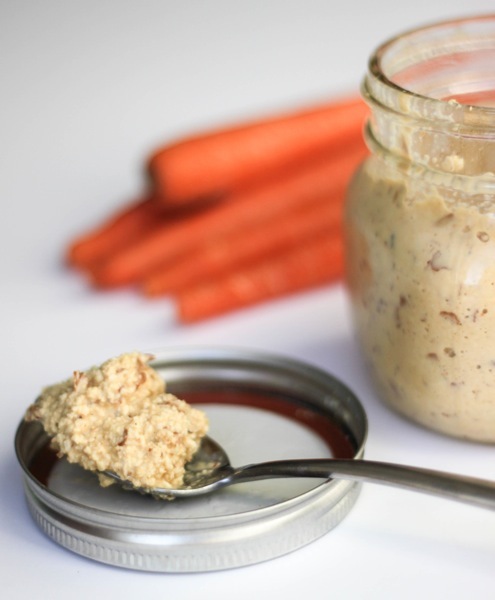 It’s great with apples or carrots or on toast, basically anywhere I use nut butter. Put all ingredients in blender and blend away! Im so intrigued! Maybe its time to change up my hummus addiction! I love Bitchin’ Sauce. That is hilarious! This looks really yummy and very creative! 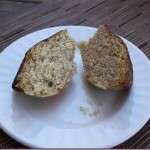 Yum, great recipe! I’ve been meaning to recommend one of my favorite San Diego spots, if you haven’t already discovered it – It’s called Noon Design Shop in Ocean Beach, on Niagra Avenue. The shop, the goods, the gals, everything about it is amazing! They did my wedding jewelry and I own several, several of their pieces. Love. Oh yum! 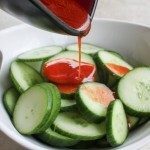 I always like adding a little cayenne. I even add it to my smoothies for a little extra kick! I love hot dips so this is great! I can’t wait to try it out! 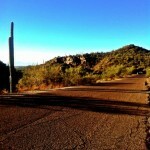 Great way to get out of that rut! ooh, that sounds so good! Like some sort of almond butter and hummus hybrid. Yum! This looks really great. 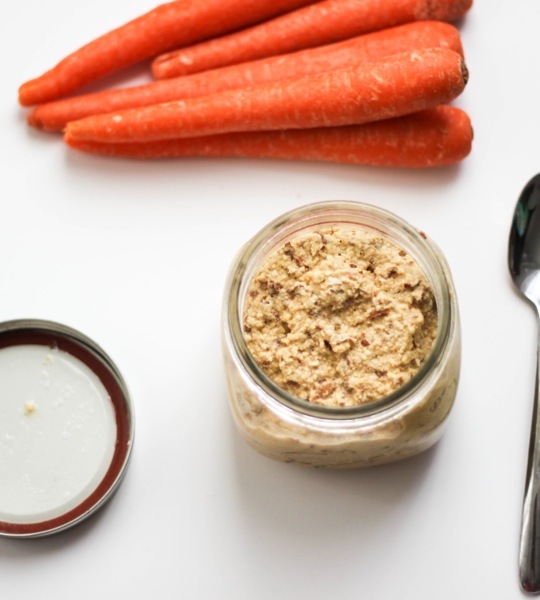 I am new to the whole “nutritional yeast” idea, and I made a dip similar to this with cashews…I am such an almond lover, I am sure I would love this too! 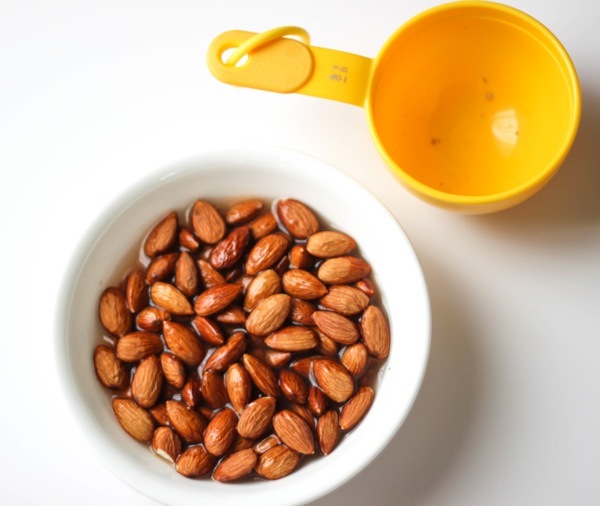 Oh yum, what a fun and creative new way to use almonds! De-lish! Oooh, this sounds so good! Oh this looks good! 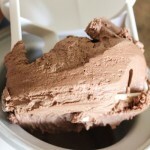 I get stuck in ruts too when it comes to food. 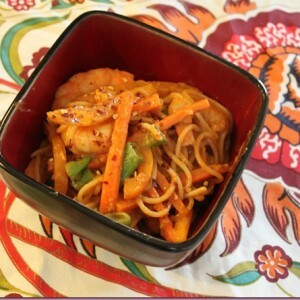 I love the addition of smoked paprika to this recipe! I’ve never thought to spice up ‘almond butter’ – yum yum. What a yummy snack! I cut out legumes awhile back and often miss hummus. This would be a great replacement! We love “Bitchin Sauce” in our house also. They have a punch card for purchases that qualifies you for a free sauce after buying 10 or so. I have also seen it being sold at Jimbos. I was curious which green smoothie recipes you like as my family and I are just getting into smoothies. I totally get in ruts too. I feel so out of the loop! 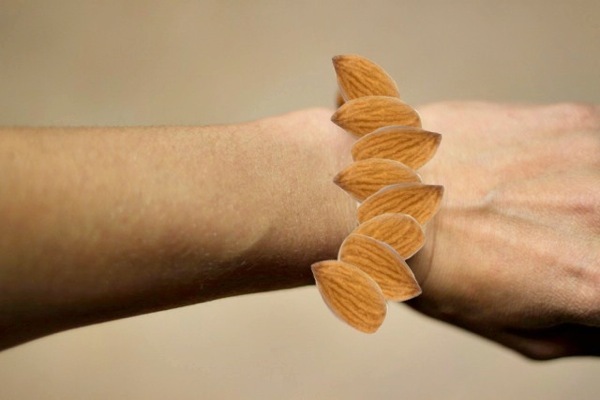 I don’t get the almond bracelet joke! Glad to see you’re adjusting to San Diego so well. It is a great city. thank you <3 yes, we're loving it here! They shirt costs like 15 or something. And every time you wear it they give you a dollar off. I mistyped above. That is what I get for commenting on my phone that early in the morning! It sounds delicious. I love almonds, and am crazy for hummus. So, can’t go wrong with a hummus-ish almond dip!! I will try it tonight, but will go easy on the chili powder, since I’m afraid it can get too spicy. So my almond dip came out a little more liquidy than I expected. 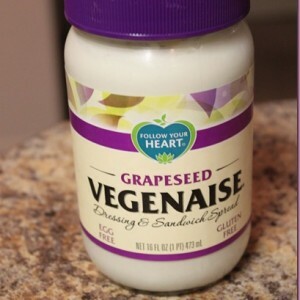 I thought it would be thick like hummus….how was yours? I’ll just do less milk next time but I was just curious. The flavor is amazing though! !